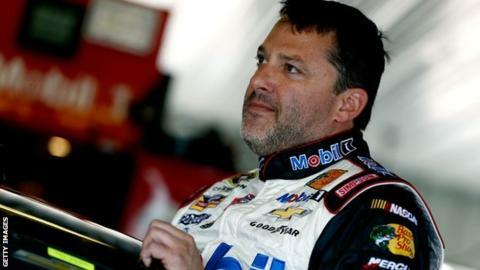 An American racing driver has died after being struck by the car of three-time Nascar champion Tony Stewart during a local sprint race in New York. Stewart and Kevin Ward Jr, 20, had collided on the previous lap of the dirt track race on Saturday. Ward climbed out of his car on to the track and was gesturing at Stewart in his passing car when he was struck. "There aren't words to describe the sadness I feel about the accident," said fellow American Stewart, 43. "It's a very emotional time for all involved. My thoughts and prayers are with Kevin's family, friends and everyone affected by this tragedy," his statement continued. Stewart is the co-owner of Nascar team Stewart-Haas Racing, having become driver-owner in 2008. His most recent Nascar crown came in 2011, and he was number 83 on the Forbes list of highest paid athletes in 2013. Stewart cancelled plans to compete in Sunday's Nascar Sprint Cup race at Watkins Glen. "We were talking through the night, and we gave Tony some time to sleep on it," said team manager Greg Zipadelli. "He feels strongly that this is the right thing to do. We at Stewart-Haas Racing strongly support it and agree with it." Stewart, who frequently competes at local sprint car events, was questioned by police and released. Ontario County Sheriff Philip Povero said Stewart was "fully co-operative" and appeared "very upset". He added: "This is being investigated as an on-track crash and I don't want to infer that there are criminal charges pending. "When the investigation is completed, we will sit down with the district attorney and review it. "But I want to make it very clear - there are no criminal charges pending at this time." Povero asked people who have video of the crash to provide copies for investigators to review. Stewart-Haas Racing said in a statement: "A tragic accident took place last night during a sprint car race in which Tony Stewart was participating. "Tony was unhurt, but a fellow competitor lost his life. Our thoughts and prayers go out to his family and friends. "We're still attempting to sort through all the details and we appreciate your understanding during this difficult time." The track, which hosted the local dirt-track event at Canandaigua Motorsports Park, located 30 miles south-east of Rochester in upstate New York, cancelled the remainder of the race within five minutes of the incident.